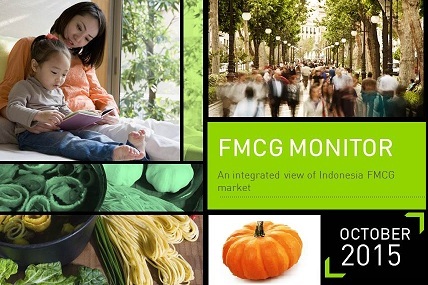 FMCG Monitor provides a brief overview of Indonesia FMCG market and its evolution across sectors. FMCG industry is still unable to bounce back to its healthy shape which is shown by a slight decrease in term of volume and value. A reduction on shopping trips does also contribute to the sluggish development of the overall FMCG industry. RTD Tea has been gaining more attention from Indonesians. Indonesians’ culture for loving tea accompanied with a “mobile version” of tea has granted RTD Tea with both value and volume boost. Supermarket and Hypermarket appear to be the only channel which have shown an improvement comparing to other trade channels. Baby products take a quite high portion of Indonesians spending on FMCG products. 22.5% of total spending goes to baby products for Households with 0-2 years old baby whereas the number declines into 14.7% for Households with 2-4 years old baby.